Our first location, Fieldstone Memory Care, is committed to enriching the lives of our residents living with Alzheimer’s, other types of dementia, and Parkinson’s disease in the Yakima area. We are privileged to serve this friendly community with compassion and engaging care! This Fieldstone Memory Care serves people living with Alzheimer’s, other types of dementia, and Parkinson’s disease living in the Tri City area. Our location boasts innovative and engaging activities such as: a vibrant Town Square, Validation Therapy and secure outdoor common spaces. Fieldstone Memory Care Issaquah is now open and serving people living with Alzheimer’s, other types of dementia, and Parkinson’s disease. Please contact us about information on our first senior living community in Western Washington. 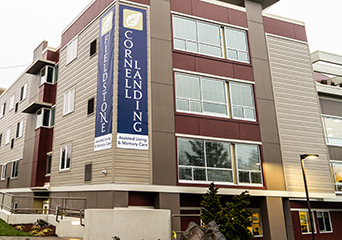 Fieldstone Communities is excited to announce our first community in Oregon! Cornell Landing will serve seniors in the Portland area and offer memory care and assisted living services. Stay in touch with us! We are proud to announce a new Fieldstone Memory Care community is now open! This community will serve residents living with Alzheimer’s, other types of dementia, and Parkinson’s disease. Sign up for updates on our progress. We are proud to announce a new Fieldstone independent and assisted living community, Cooper Point, opening in Spring 2019! Sign up for updates on our progress as we build in the vibrant community of Olympia, WA. Fieldstone Communities is excited to announce a new Fieldstone Memory Care community is now open! This location will exclusively serve residents living with Alzheimer’s, other types of dementia, and Parkinson’s disease. Stay in touch with us! Fieldstone Communities is excited to announce a new Fieldstone Memory Care community opening in 2020! This community will specialize in memory care services to support residents with Alzheimer’s and other forms of memory impairment. Fieldstone Communities is excited to announce a new Fieldstone Memory Care community opening in Fall 2019! This location will exclusively serve residents living with Alzheimer’s, other types of dementia, and Parkinson’s disease. Stay in touch with us! In winter 2019, a new Fieldstone Memory Care community will be opening in Marysville, Washington! The new community will support residents that have memory impairments such as Alzheimer’s and other forms of dementia.